Successfully Added PC to TV Converter - Use Your HDTV as a Computer Monitor to your Shopping Cart. PC to TV Converter - Use Your HDTV As A Computer Monitor. With this powerful PC to HDTV converter you can use your big screen HDTV to watch movies from your PC, browse the internet, or simply to use as your primary or as a secondary computer screen. If you enjoy downloading movies, or watching Netflix online, then you will definitely enjoy being able to it all from the convenience of your big screen HDTV! This easy to use adapter even comes with a HDMI, DVI and VGA connector for use with all HDTV brands. 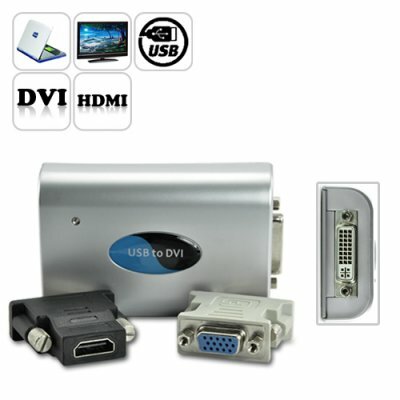 This PC to TV converter also allows you to connect extra PC monitors (via VGA) to your computers USB port. Once connected the display can be configured to either mirror your desktop, or extend the Windows desktop allowing visibility of more applications at the same time. And for the multitasking masters out there, you can even connect up to six PC to TV converters at the same time, allowing each screen to extend to the next! View your large spreadsheets across two screens and multitask more effectively without overlapping windows. Create timelines on one screen while viewing reference material or toolbars on the other. View charts on one monitor and compare live data on the other. View video or TV on one screen and surf the web on the other. Or, use 3 monitors and create the ultimate gaming station. If you ever wanted to use that beautiful HDTV as a computer screen, or simply want more than one active computer screen, then this is the product for you. The K79 is compatible with all HDTVs that use a HDMI or DVI connection, and all computer monitors that use a VGA connection. The K79 is quick and easy to install and comes with everything you need to get started instantly. And don’t forget, the K79 comes with our famous 12 month guarantee and is in stock now and ready for next day shipping. Install the included software drivers before using this product. Can I use this adapter with a standard definition TV? Only if the TV supports a VGA connection. on 2011-09-04 01:13:37 Hyvä ostos !